Today marks the start of a nationwide anti-litter campaign launched by Environment Secretary Michael Gove in partnership with Keep Britain Tidy. 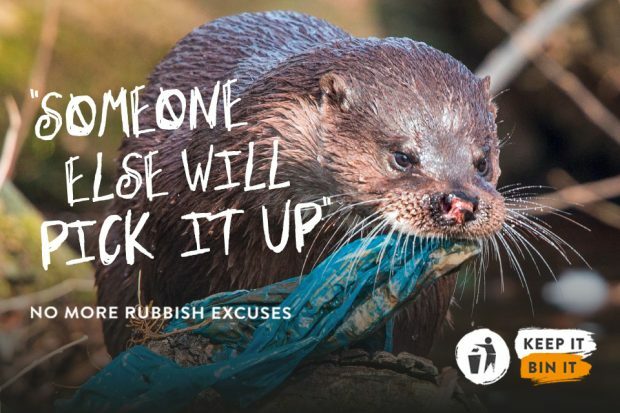 The campaign is backed by some of the biggest names in retail, travel and entertainment, and features poignant images of wildlife eating and getting tangled in litter, contrasted against typical excuses people give for dropping litter. The emotive imagery demonstrates the impact littering can have on the environment, with the RSPCA responding to 1,500 calls about litter-related incidents affecting animals every year. Today the campaign is on display in train stations nationwide, including commuter hubs such as London Euston, Manchester Piccadilly and Birmingham New Street, as well as across partners’ social media channels. After launch, the campaign will feature at till-points in Gregg’s stores and at Cineworld cinemas through the partnership with PepsiCo. The focus of the campaign will be on the 16-24 age group as evidence shows littering is the highest amongst this demographic, and will aim to make littering culturally unacceptable within a generation. This is one of the first times that government is running a campaign that is almost fully funded by commercial partners. The campaign follows the first ever Litter Strategy for England, published last year, which sets out how government will work to clean up the country, change attitudes towards littering, and strengthen enforcement powers. Earlier this year we doubled the maximum on-the-spot penalty for littering , gave councils new powers to tackle littering from vehicles, and have made £450,000 funding available through the Litter Innovation Fund to pilot new ways to tackle littering.